(Bloomberg Opinion) -- It’s that time of year, when students prepare to head back to the classroom. For many taking the next step in higher education, the question is increasingly, “Is it worth it?” Millions of millennials have already put off settling down because of the rising costs of servicing college debts to the detriment of economic growth. 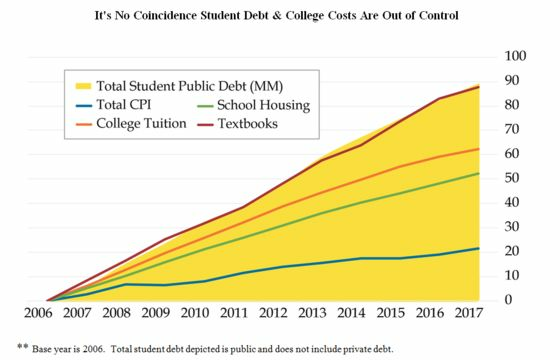 Student loans are now the second-largest category of household debt in America, topping $1.4 trillion and trailing only mortgages at $9 trillion. And while Korn Ferry puts the average starting salary for a 2018 college graduate at $50,390, up 2.8 percent from 2017, the just-released July Consumer Price Index report shows the inflation rate rose 2.9 percent over the last 12 months. Does the phrase “treading water” come to mind? A recent report by Bloom Economic Research breaks out the demographic challenges that have resulted from the 176 percent increase in student loan debt in the decade through 2017. In the years leading up to the housing crisis and the dramatic loosening of mortgage credit standards, many families tapped readily available home equity to finance pricier higher educations for their children than they would have otherwise been able to afford. After the bust, this avenue was blocked, leaving only the higher education inflation it had fueled. From 2007 through 2017, the CPI rose by 21 percent. Over that same period, college tuition costs jumped 63 percent, school housing surged 51 percent and the price of textbooks by 88 percent. These troubling growth rates wipe away any mystery behind today’s staggering levels of student loan debt, which have almost tripled from the 2007 starting point of $545 billion. As of the fourth quarter, student loans represented 10.5 percent of a record $13.1 trillion in U.S. household debt, up from 3.3 percent at the start of 2003. Regardless of income bracket, housing is the biggest line item in family budgets. On that count, the best news for fresh grads is that rent growth appears to be slowing as a flood of apartment supply hits the market. According to RentCafe, the average rent in the U.S. was a record $1,409 in July, a 2.8 percent from a year earlier. While rent growth has stopped outpacing gains in salaries, the level is nevertheless prohibitively high for many, especially those weighed down by student loans the minute they cross the stage. The average student loan payment is $351. Tack that on to average rents and you’re pushing $1,800 before you hit the online grocery app icon on your smart phone, the bill for which runs at least $100 a month for most of us. Using college grad starting salaries, that takes up a large chunk of monthly take-home pay of about $3,400 if you live in Texas or $3,100 if you’re in New York. The latest demographic breakdown available has an end point of 2016. What we know through that period is that 22.4 percent of all U.S. households carried student debt, with the percentage rising to 44.8 percent for those aged 18-34, or $33,000 on average, up from 18.6 percent in 2001. The average household has to save for almost six and a half years to cover a 20 percent down payment on a home at current prices, according to a recent study by Zillow’s HotPads. That’s based on the steep assumption that workers can sock away 20 percent of their monthly take-home pay. The outer birth-year band for millennials is 1981, making 2018 the year millennials are closer to 40 than they are to 30. While homeownership has picked up, it’s been held back for a decade due to the stagnant wage growth coupled with onerous debt burdens. The macroeconomic ramifications are well-documented. Baby boomers house a record level of their millennial offspring who can’t afford to leave home. Birth rates have fallen to a 30-year low as marriage is put off. Emanating from this trend is the money not plunked into nesting as families grow, a consequence not lost on Federal Reserve Chairman Jerome Powell. Clearly, reform of some kind must address the issue of student debt, which is not to say debt relief or outright forgiveness. Institutions of higher learning in this country must take some of the responsibility for the current state of affairs in the nation’s most populous demographic group. And while the misguided cultural stigmatization of vocational education appears to finally be abating, further inroads to reintroduce balance to the workforce must be made. The return on investment in a four-year degree isn’t as straightforward as it was for high school grads circa 1988. The reality of cost burdens must be weighed against the quality of life millions have forsaken thanks to the ease with which they’ve been able to finance the higher educations that have rendered their lives to lower rungs. Danielle DiMartino Booth, a former adviser to the president of the Dallas Fed, is the author of "Fed Up: An Insider's Take on Why the Federal Reserve Is Bad for America," and founder of Quill Intelligence.